Russia and its leader Putin only respect strength. The NATO countries who are NOT investing their committed 2% to defense spending are sending a message to Putin that they do not take Putin’s threats seriously and that they are not willing to invest in their own defense to stop Putin, PERIOD! This should give pause to the Baltic NATO members and wanna be NATO members such as the Ukraine that only 18% of the NATO members take Russian threats seriously, let alone ISIS. 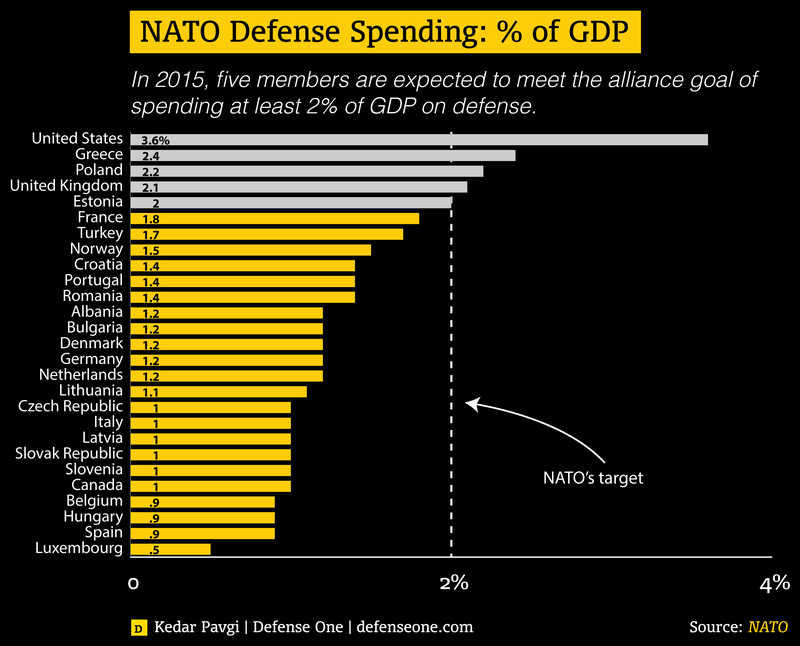 Below is a chart showing each NATO member and their respective commitment to their own defense spending. The US liberated France in WWII yet France only contributes 1.8% of their GDP to defense. Germany, who we rebuilt after WWII and who we helped in their unification only spends a measly 1.2% of their GDP on defense spending. Other countries who are dodging their commitment to NATO who we have defended or liberated in the past include Italy at 1%, Spain at .9%, Czech Republic at 1%, and many of the members of the Baltic States Council who are under threat right now from Russia, include Denmark at 1.2%, Latvia at 1%, Lithuania at 1.1%, and Norway at 1.5%. If you are Putin looking to regain much of the Soviet Union’s empire states, why would you fear a bunch of countries that do not even meet their minimum standards of financial support that they agreed to! Obviously Putin does not respect NATO nor its pathetic non paying members. Putin’s incursions into the Ukraine and Crimea are merely the beginning if NATO remains pathetically uncommitted. ISIS has already infiltrated into the core nations of NATO via the EU’s open borders policies. The EU is more committed to maintaining their open border policy than defending themselves and their citizens against Putin or ISIS.